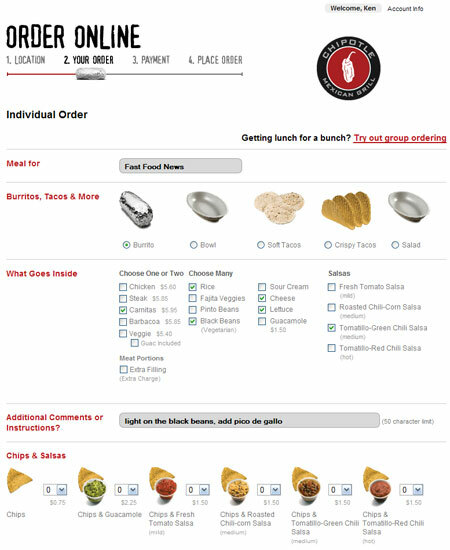 Chipotle now has new, enhanced online ordering for all their restaurants. You can place your order at order.chipotle.com. You can place specific orders for separate people. There is an order summary at the bottom of the page after you add each person's 'bag' to the whole order. There's also an expanded group ordering function that lets you place multi-item orders under a single group name and invite friends or co-workers (via e-mail) to add their single order to the group order. You can save your favorite orders, too. So if you regularly order the same thing, it will be there with one click the next time you log in. A screen grab of my most common order is below. A note about logging in... be ready to come up with a password for your account that is 8 characters long, has at least 1 uppercase letter, at least 1 lowercase number and at least 1 number! A tad annoying, but great security! All in all a great online ordering experience. And the burrito was great, as always. "This is another way we are making our high quality food available and affordable so everyone can eat better," says Steve Ells, Chipotle founder, chairman and CEO. "We can deliver a great Chipotle experience in a way that meets the demands of time-pressed customers." "We asked our regular online users and our most tech-savvy customers how to best improve this system," Ells says. "This new version is faster, easier to use, and will enable us to add additional features and applications as new technology allows."